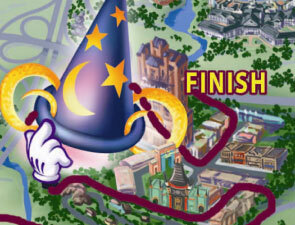 Dan emailed me a link to these maps that Disney has up for their ”Twilight Zone Tower of Terror 13K” run. Take a look at the 13k and the 6.5k maps. They are both really horrible, but take a look at this part of the 13k map. I’m not sure what happens under that hat with the route, but I’m sure it is magic! I’ve tried to piece together the route from both runs, but I’m at a loss.